The CROS-ARC Elite Plasma Range are the latest evolution of generator compatible, inverter based power sources incorporating electronic current adjustment. It utilises the latest back strike arc initiation technology, making it suitable for use in electronically sensitive areas. This range of machines offers exceptional cutting performance on a wide verity of materials including Steels, stainless Steels, Aluminium and Copper etc. Supplied complete with plasma torch, earth lead. This Machine also features a dedicated CNC controller output for a torch height controller, with a built in voltage divider. 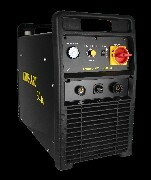 We can supply various machine torches should you require one.